His name: St. George Tucker. And The Legal Genealogist thinks he was a pretty cool dude — and one every genealogist who ever needs to research in Virginia ought to get to know really well. Now I’ll grant you that I’m a law geek — and so was St. George Tucker (1752-1827) — which means I’m already predisposed to like the guy. The mere fact that he studied law at the fledgling College of William and Mary and finished his legal training with George Wythe before being admitted to the bar in Virginia would make me like him. And his roles later as a professor of law at the College of William and Mary, and as a Virginia lawyer and state judge and, later, federal judge,2 just make me like him more. C’mon… he was a pretty cool dude. He compiled and edited a five-volume Virginia-specific treatise on the English common law,4 giving those of us who research in that jurisdiction a real leg up in understanding how the common law was integrated into American and specifically Virginian law before, during and after the Revolution. What Tucker did was explain how we here on this side of the pond did or didn’t use the work of yet another law geek, William Blackstone (1723-1780). He was the youngest son of a prosperous middle class London family who basically didn’t make good as a young lawyer. He went into academia, and decided to give a series of lectures on the law. Those lectures became the cornerstone of what became known as Blackstone’s Commentaries on the Laws of England, perhaps the most comprehensive review of the common law as it existed at the time. But here’s the kicker: the common law wasn’t exactly common everywhere it was followed. It’s a dynamic legal system, one we follow here in America today, with judges playing an active role not just in determining what the law is but also in what the law should be. And even in early America, the common law here was sometimes more than a tad different from the common law of England. So for those of us who struggle with understanding how that English common law worked when it was brought into American — and particularly Virginian — law, we can read Tucker’s version — free, online, digitized. Yep, we can get all Tuckered out and get it on with the common law — American and Virginian style. Thanks to St. George Tucker, indeed a man of parts. Cite/link to this post: Judy G. Russell, “All Tuckered out with Virginia law,” The Legal Genealogist (https://www.legalgenealogist.com/blog : posted 3 Apr 2019). 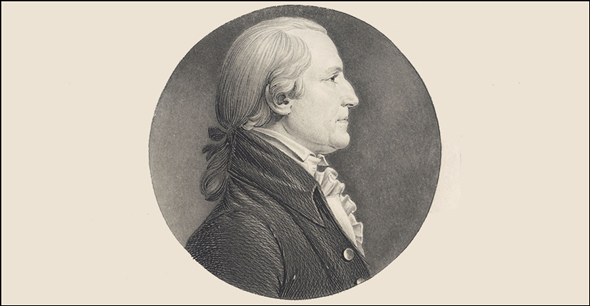 Image: Charles Balthazar Julien Fevret de Saint-Mémin, engraving, St. George Tucker, Library of Congress Prints & Photographs Division. You mean that since before the United States of America even came into existence, American judges have been making law instead merely interpreting what the statutes say? That judge-made law is a process as old and honorable as the Constitution itself? That the system of codes is an idea invented by foreigners? OMG — I’m shocked, shocked! Yeah, that alone was worth clicking on this one for. But my interest goes a bit deeper. I finally traced the line I think is my black/white line to a specific place in Virginia. One bit of VA law I discovered right away (because it is referred to several times in two wills) is that freed blacks, in this period at least,were not allowed to stay within the borders of VA w/o gaining permission from the VA legislature. This is good to know as I begin sorting out folks and finding some not there. Your timing is impeccable, Judy, as your links to Tucker popped up just as I am beginning this part of my journey. As I’m sure you know (and now I do too), VA is devilish hard to research, though they are hard at work on getting papers digitized, indexed, and online. I got lucky in my first foray when I found two wills written by two men who may or may not be related and who may or may not be connected to my family (other names mentioned suggest the possibility, but do not verify it). Learning what they law has to say about the complexities of these kinds of relationships is going to be essential. But you know what? I may actually have to *move* to Virginia to actually do research on these folks! That’s a fact, Judy. Reading these two wills was wrenching. Both by freedmen who had to “own” their wives in order to maintain the integrity of their relationship, and were desperately trying to cover all potential circumstances after their deaths to protect them. One also directed that all proceeds from selling his estate after his debts were paid were to be used to purchase and manumit his son, a slave held by one of the men who witnessed the will. I hope I can find some evidence that happened. I don’t know if I am descended from these families, or if my people might have been owners and relatives. But I can tell their stories. And I must. As I noted a few years ago, delayed availability of the law books from England was a major cause of the divergence of the American common law from the English common law because the law book. From Pens to Pixels: Text-Media Issues in Promulgating, Archiving, and Using Judicial Opinions, 4 J. App. Prac. & Process 353 (2002).